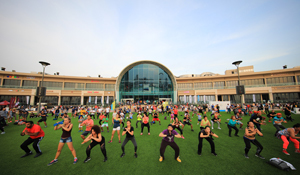 This year the month-long campaign includes five themed fitness villages at DIFC, DMCC Park, Kite Beach, Al Khawaneej Walk and Palm Jumeirah with an incredible array of activities for all ages, abilities and levels of fitness. The villages will run for 26 days during DFC at locations accessible to communities across Dubai to make it even easier for everyone to build 30 minutes of exercise into their daily routine. There is something for absolutely everyone as the Challenge encompasses all forms of activity – from beach cricket, cycling and football, to paddle boarding, team sports, walking and yoga, as well as everything in between. All are encouraged to participate individually or together with friends, family and colleagues, enjoying new and exciting ways to improve their fitness levels.